Papers in Mediaeval Studies 26. 2014. viii, 316 pp. 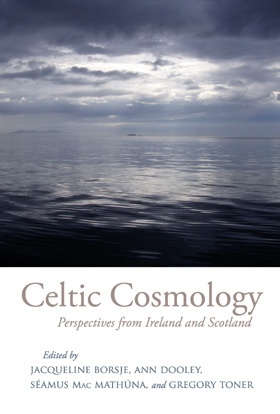 The essays in this collection, many originally presented at a 2008 colloquium on Celtic Cosmology and the Power of Words, aim to examine the worldviews held by the Celtic peoples, particularly the Gaelic (Irish and Scottish) perspectives; the main sources are inscriptions and texts in Celtic languages and in Celtic Latin. From the deep sea to the waters above the sky, from the world beneath our feet to the promised land across the ocean – this volume represents a search for traces of cosmologies in Celtic sources, especially those of Ireland and Scotland. These cosmological traces are investigated for their Indo-European and Semitic parallels and influences. The broad world orderings – Celtic tripartition (earth, water and sky) and Christian bipartition (this world and the next) – are explored, and the cosmological meaning of specific demarcations in the landscape is analyzed. The world was mapped with words, as signposts for contemporary and future generations. These written “maps” are not only geographical, they also constitute ethical and mythological guidelines. Through storytelling, landscape and social space are processed in a framework of cosmic good and evil. In a Celtic mental world roads, rivers, mountains and hills are vital markers. Hills and caves were used in rituals and were seen as entrances to a subterranean otherworld where supernatural beings dwell and knowledge of the cosmos was believed to reside with these supernatural or subterranean beings. This knowledge is connected with protection and violation of the landscape and waters, and is often associated with the king, truth and justice. In the socialized landscape features of periphery and centre are closely related to kingship: thus, looming tragedy can be deduced from the route that a mythical king takes; royal capitals are outlined in landscape and architecture as ritual centres. The naming of significant places is a human act of creating order. In the Celtic literary tradition of explanatory and etymologizing stories, place-names serve as signifiers and warning signs (taboos) and some Celtic narratives on naming places appear to function also as performances of atonement for disruptions of the cosmic order. Jacqueline Borsje is Professor of Medieval Irish Culture and Religion at the University of Ulster and Senior Lecturer in the Cultural History of Christianity at the University of Amsterdam. Her research ranges widely across the religion, mythology, and literature of medieval Ireland. She is the author of The Celtic Evil Eye and Related Mythological Motifs in Medieval Ireland (2012). Ann Dooley is Professor Emerita of Celtic Studies and Medieval Studies at the University of Toronto. She was co-founder of the Celtic Studies Program at Saint Michael's College, University of Toronto, which she directed for fifteen years. She is the author (with Harry Roe) of Tales of the Elders of Ireland (1999), and Playing the Hero: Reading the Irish Saga Táin Bó Cúailnge (2006), as well as numerous essays. Séamus Mac Mathúna is Professor of Irish and Celtic Studies and former Head of Irish and Director of the Celtic Studies Research Institute at the University of Ulster. He is Founding President ofSocietas Celto-Slavica, general editor of Studia Celto-Slavica, consultant editor of Studia Celtica Upsaliensia, and is a committee member of the Royal Irish Academy's Foclóir na Nua-Ghaeilge(Historical Dictionary of Modern Irish). Gregory Toner is Professor of Irish at Queen's University, Belfast. He edited the electronic version of the Royal Irish Academy's Dictionary of the Irish Language based mainly on Old and Middle Irish Materials and has produced a supplement for an extended and revised version of the dictionary (www.dil.ie). He is also editor of Ainm: A Journal of Name Studies.